Available with fully concealed hinges. TRU aluminium doors open up numerous new possibilities for the attractive design of the outside of the building envelope. TRU Entry Doors are customized to meet the most demanding architectural requirements; including specifications for concealed hinges, transoms with custom divided lite patterns, and over-sized doors. The TRU difference is in the sophisticated technology and excellent system compatibility. From soaring entryways to the seamless integration of doors in to a wall of glass, our system provides the optimum combination of design and function. 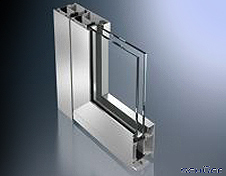 Thermally broken aluminum frames for maximum energy efficiency and reduction of solar heat gain. Vulcanized gaskets on each corner of the window to eliminate corner leaks.